The Iranians had been favourites against the four-time Asian Cup champions in the semi-finals, but were, in the end comprehensively beaten by Hajime Moriyasu’s team. “The innocent mistakes from my players that resulted in a goal caused an emotional breakdown in my players…The best team won… Thank you to my players for their efforts over all these years they’ll be in my heart for the rest of my life,” said Queiroz. 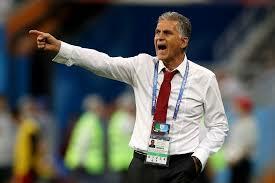 In 2011 Queiroz took the Iran role and coached Team Melli to two World Cup finals and the top spot in Asia. The Portuguese wanted to lead his team to a first continental victory in 43 years. The Iranians have failed to progress from each of their last six semi-finals at the Asian Cup since beating China 2-1 in 1976. “It was an honour to be side by side with these great men, in this eight-year journey, facing all the adversities, always and always with great character, the top character for which I believe they deserved to play the final. “Congratulations to Japan, the best team tonight, but honour to Team Melli, for what they built for their people, for the football they show to the World, and for the legacy they take to the future. During the Asian Cup, Queiroz has been increasingly linked with the Colombia vacancy. The Portuguese batted off the speculation repeatedly, but admitted he was flattered by Colombia’s interest. If Queiroz were to become Colombia’s coach he will face Japan in a friendly in March.